Gospel Doctrine New Testament Lesson #5; Luke 18, Luke 19 and John 11. I have been at the birth of six children: four of my own and two of a friend. The birthing process is often long, hard, and messy, but ultimately a beautiful child of God comes from it. When Jesus says that we need to be born again or we cannot see the kingdom of God He isn’t giving us an easy thing to do. Often we think of being born again as just being baptized and receiving the Holy Ghost, but there is much more to it. Being baptized is just entering the gate. It is after that gate that we have a long narrow path to follow. Following this path to eternal life and the kingdom of God is a lifetime endeavor. Dorcas (or Tabitha) is a woman in the scriptures who gives us a glimpse into this life-long process. In Acts 9:36-42 it tells us her story. Dorcas’ story has always been a favorite of mine. I love to sew. 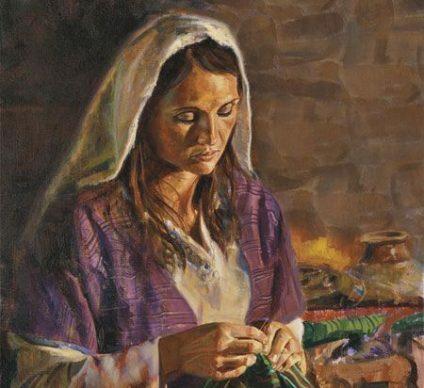 So I especially love that there is a story in the scriptures about a woman who uses her talent for sewing to do good. I love that when Peter comes to see the mourning people that the widows show him the coats and garments that Dorcas had made. Sewing takes time. A lot of time. It’s not easy to make a coat or a garment. But Dorcas made these garments and then gave them away. And she did this often enough that there are many to show Peter when he comes. These garments also aren’t shown to Peter by wealthy people, they are shown to Peter by the widows. These garments weren’t being made and sold, they were being made and given to those in need. Dorcas was a disciple and she showed her faith throughout her life by the service and love she gave to others. In Alma 5:14 it says, “have ye spiritually been born of God? Have ye received his image in your countenances? Have ye experienced this mighty change in your hearts?” When I read this I think of what Jesus Christ would do in all situations. I ask myself what it means to have his image on my countenance. What do I look like when I look like God? For me it means serving as he would serve, loving as he would love, giving as he would give and then doing those things over and over and over again. These aren’t easy things to do, just like sewing or giving birth aren’t easy, but in the end they are the things that lead to eternal life.